Zeenat Aman and I were invited to the first edition of the Jaipur Lit Fest being held in Adelaide under the auspices of OzAsia. It was an interminable flight, and I had been dreading it for days prior to the departure. As we landed in Singapore, my spirits rose at the sight of a familiar person—yes, indeed, it was my old friend Zeenie Baby herself. We had three hours in the lounge to catch up on each other’s lives, and then three whole days in Australia to keep one another company between hectic sessions and receptions. It was Zeenat’s first trip Down Under. As for me, I was happy to spend time with a brave and warm individual I have known and worked with over five decades. We started our modelling careers at around the same time and shot several campaigns together, notably Taj Tea. We also posed for several editorial shoots for mass circulated magazines like Femina, helping each other out with make up and hair styling tips. Of course, after she joined Bollywood we lost touch completely. Our paths rarely crossed, even after she retired from the movies to raise her two boys. But, the reconnecting happened spontaneously and easily, as if the intervening years had been nothing more than a small pause. 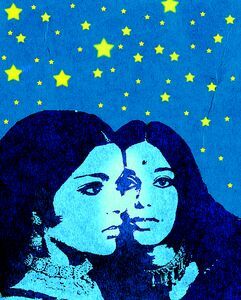 The thing I rediscovered about Zeenat is her innate shyness. She keeps to herself and speaks very little. She does not like impromptu requests for selfies or small talk. But, she responds to intrusions with graciousness and obliges fans with a smile and a nod of acknowledgment. It was great to see how two generations of overseas Indians reacted to a former star with so much excitement. Whether at the airport or at the festival venue, Zeenat was regarded with awe and admiration—which of course, she fully deserves as a breaker of Bollywood moulds. It was Zeenat who changed the popular perception of desi heroines by boldly bringing in her westernised style and uninhibited presentation. It took an equally westernised film maker (Dev Anand) to tap into Zeenat’s sensual personality and present her in a tailor-made role—that of a chillum-smoking hippie looking for love in Kathmandu. With her rendition of ‘Dum Maro Dum’, Zeenat instantly became the sweetheart of millions, and paved the way for others like Parveen Babi to follow. Just as audiences were delighting in the new avatar of the modern Indian girl, Zeenat accepted Raj Kapoor’s offer to play a tribal woman with a half-burnt face in Satyam Shivam Sundaram. I asked her what made her take such a quantum leap and she laughed at the memory, recounting how every single actress in Bollywood chased that one single dream—to be an R.K. Heroine. On our last day in Adelaide, at the after-party for delegates, we were all left stunned when Zeenat obliged everybody by briefly singing and swaying to ‘Dum Maro Dum’. The younger lot could not believe they had been in the same room as such a huge diva and even danced alongside her. Did Zeenat herself have a good time letting her hair down after years of struggling with various problems? I think she did. On our long flight back to Mumbai, we talked about her multiple challenges as a single parent. Zeenat Aman is a no-quitter. She is fighting on courageously, travelling the world—from Norway to Surinam—where her fans give her abundant love. As she commented wryly, “I did not have time to enjoy my fame back then; I was too busy working.” But, today, she is enjoying the fruits of all that labour, with her sons by her side and her loving friends to remind her that she is special.